Product prices and availability are accurate as of 2019-04-24 07:00:17 EDT and are subject to change. Any price and availability information displayed on http://www.amazon.com/ at the time of purchase will apply to the purchase of this product. 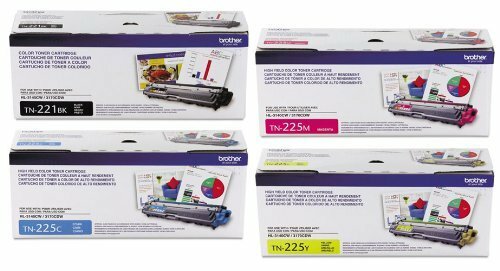 Brother TN-221 Black Standard Yield with Brother TN-225 High Yield Toner Cartridge Set that contains Three(3) color compatible cartridges (Cyan TN225C, Magenta TN225M, Yellow TN225Y) for Brother HL-3170CDW printer. 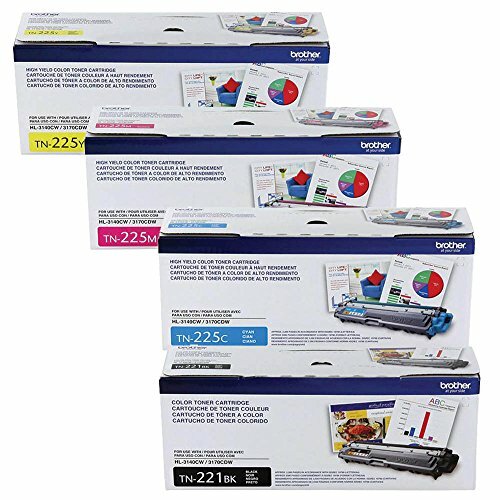 These toners has been designed to work with a range of Brother printer(s).The TN-221 Black toner cartridge will approximately yield up to 2,500 pages and each TN-225 Color cartridge up to 2,200 pages. Manufactured by Brother.